Back to Back 6A State Champions!! Pinnacle beats 4A State Champions, Shadow Mountain, breaking their 72 game in-state winning streak. Welcome to the Jungle Tournament Champions! #1 Pinnacle-Coach Charles Wilde has another talented starting five led by one of the top or arguably the top player in state in Arizona commit 6-3 senior PG Nico Mannion. He has the ability to take over games at any moment. Alongside Mannion will be seniors 6-1 PG Trent Brown and 6-6 SF Jordan Mains. Both can and will have big games during the year to take some pressure off of Mannion. Both will be playing D1 hoops after HS as well. The man in the middle could have a breakout year in 6-9 junior C Tosh Baker. Baker has legit size, strength and skill to have a nice inside/outside compliment that all teams covet. Without superstar QB/SG Spencer Rattler, they will look to a few players to fill that last starting spot and provide some depth with juniors 6-0 PG Marcus Libman, 6-3 W Spencer Allen and 6-3 senior W Keegan Schenk. All 3 can shoot it plus defend. Mannion and Brown will set the tone for the Pioneers with their shooting and decision making. 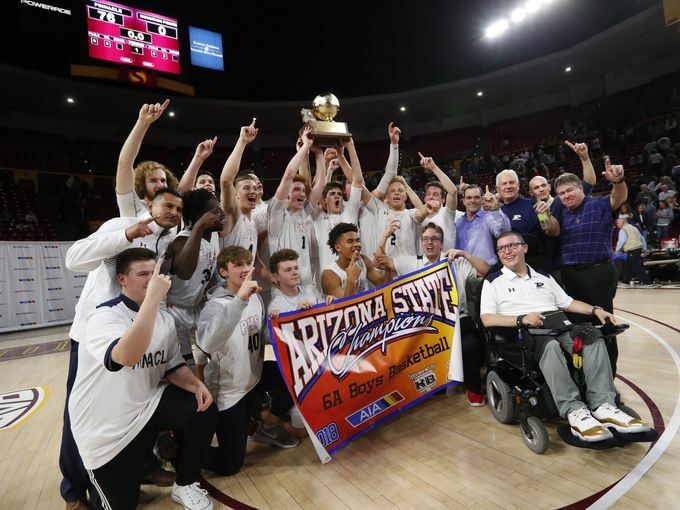 With Nico Mannion and Trent Brown returning to the backcourt, and Jordan Mains able to defend any position on the court, there is no reason to doubt this team as it tries to repeat as 6A champs. They have a date with Shadow Mountain on Nov. 30 to see who is the best team in Arizona. Nico Mannion, Phoenix Pinnacle, 6-3, PG, Sr.
Mannion is the nation's highest-rated point guard for the 2019 class. He reclassified from a junior to a senior and will put on a show this year before starting his college career at Arizona. Big hops, great passer, awesome first step, poised leader, championship resume. Averaged 23.4 points, 5.8 assists, 4.7 rebounds, 2.0 steals, made 44 percent of his 3s and 83 percent of his free throws.